Finally finished after 5 years! 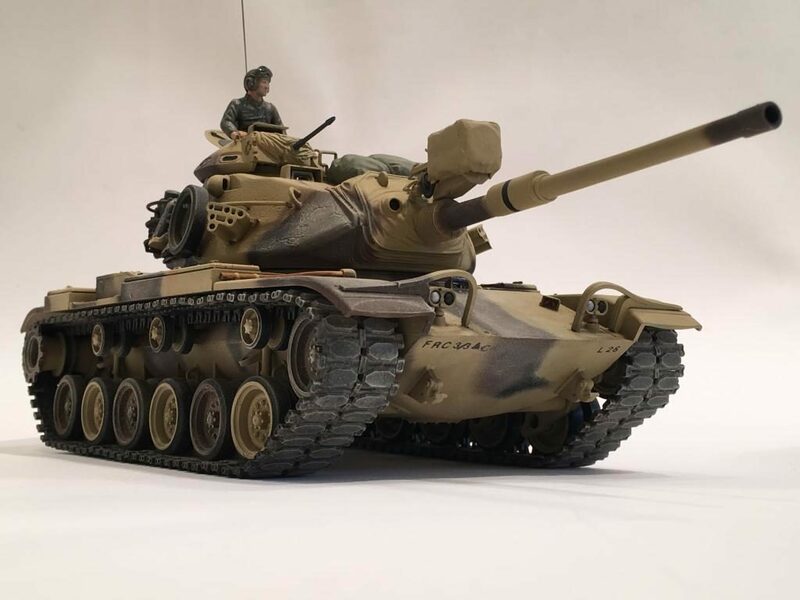 I built this tank and had about 95 percent of it finished. 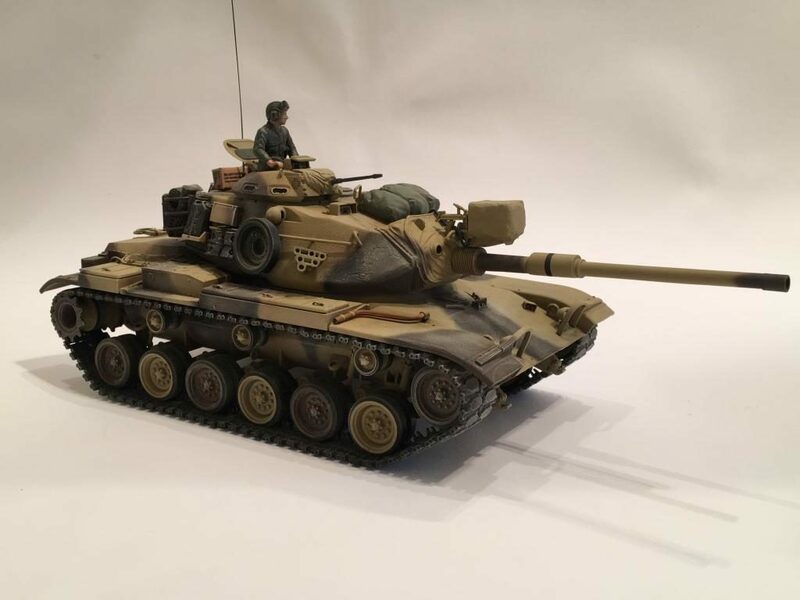 It was sitting in my display case awaiting the final touches… So I took a break from the Midway Group Build and finally completed the old girl… It was on my “To Do” list. 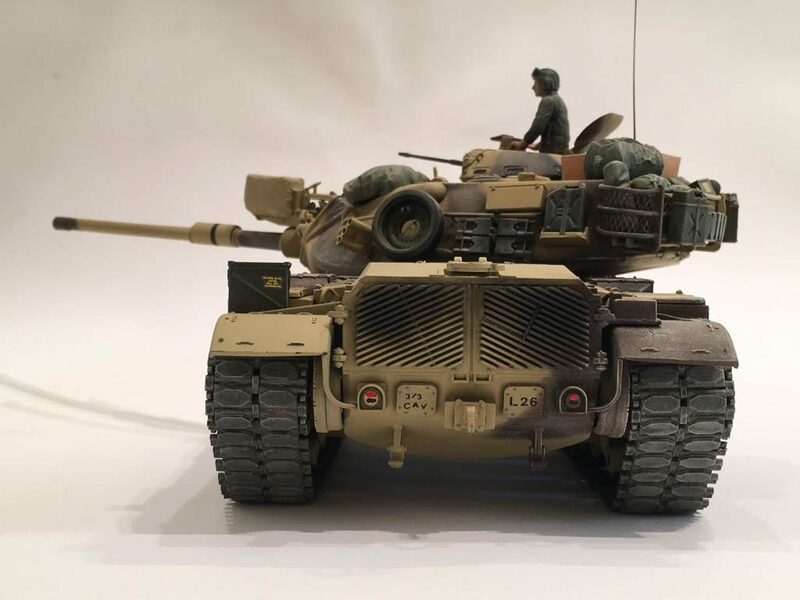 This is painted and decaled almost exactly like one of the tanks I served in, when I was in the US Army many years ago. I have included some pictures that I recently found that were hidden away for years at my Mom’s house. 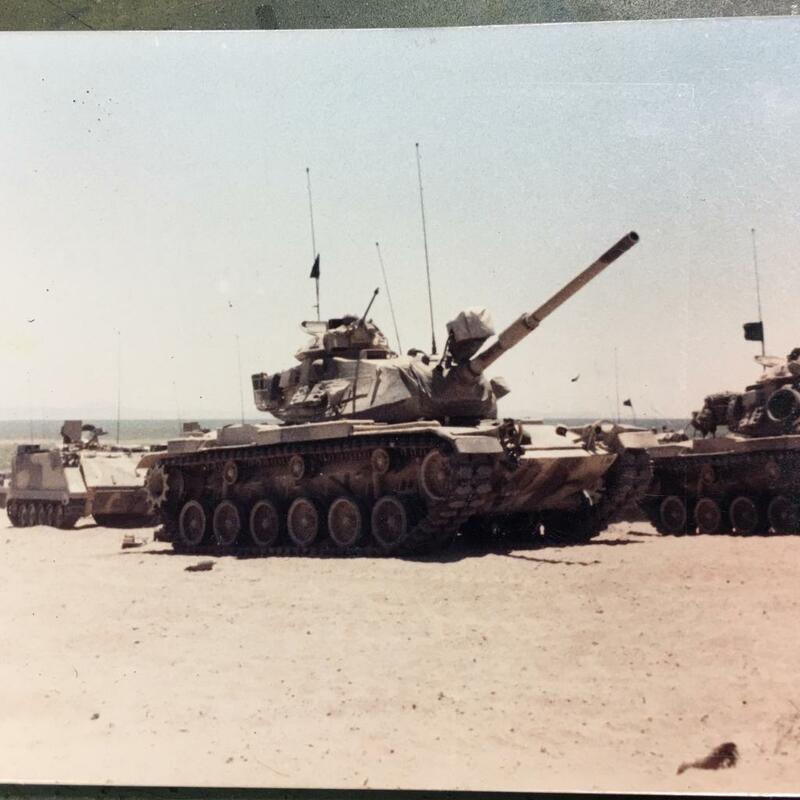 These are all photos of tanks that I was a crew member in at one time or another. This picture below shows me in the Commander’s position during my first ever trip down range as a Commander during a “Live Fire” gunnery exercise. 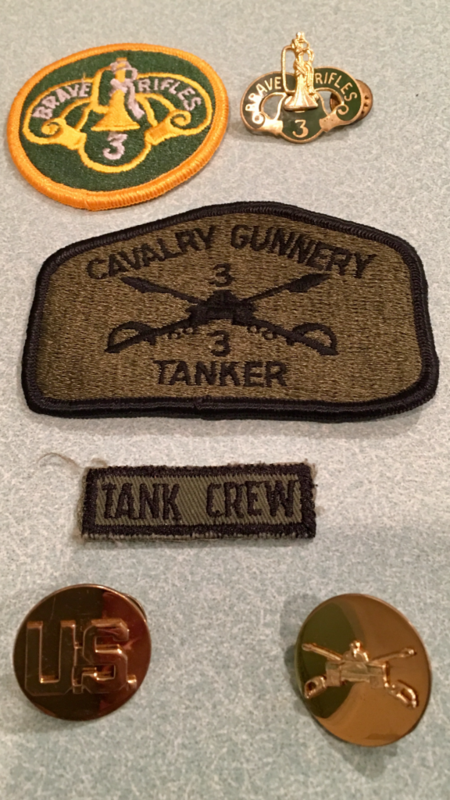 At this time in my military career, I was the Gunner on the Platoon Sergeants tank. As such they trained me to be a Commander just in case something happened to him. That way I could take over the tank in the case of an emergency. We all trained to the next level above the current position we held and operated in. Here the “Green Flag” is still being flown because at this point our weapons were not loaded just yet. In case you’re wondering, we qualified rather well on this trip down range. I had a great crew… and it helped. 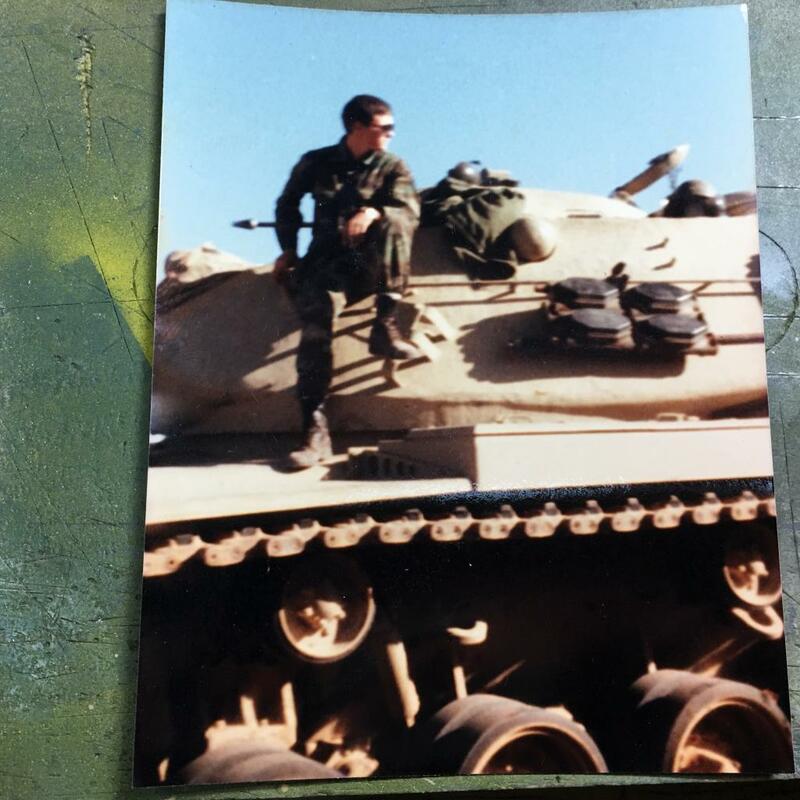 We trained with our old M-60’s, using the newer M1 Abrams firing qualification tables. I’m not bragging, but we had a very highly trained tank force. This really came into play several years later during Desert Storm when my old unit, the 3rd Armored Cavalry Regiment was deployed with the 82nd Airborne during the early stages when it was still “Desert Shield”. 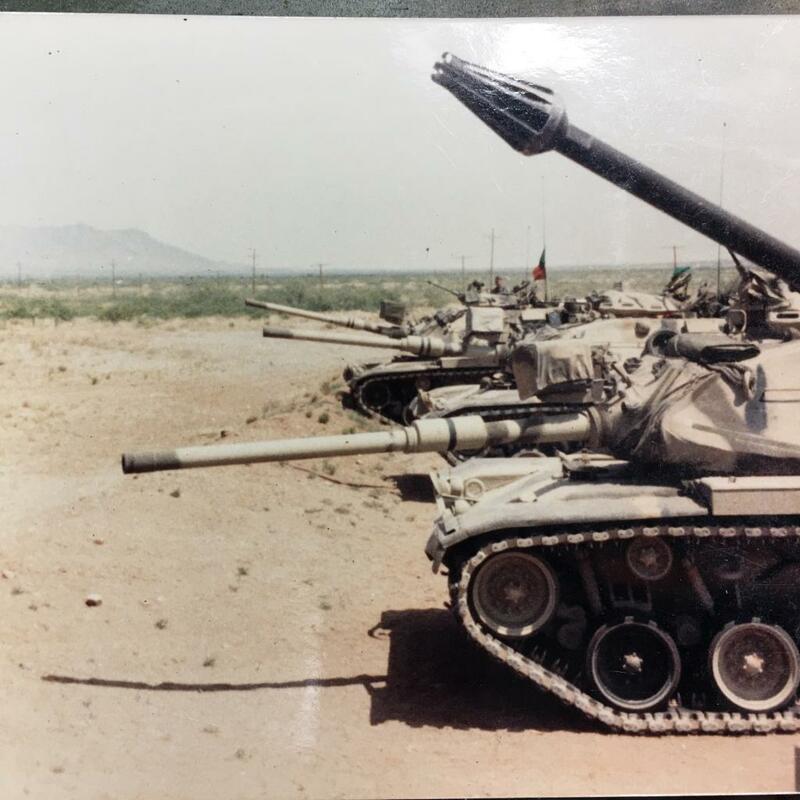 Here’s the same tank below, after we returned and had all weapons cleared. This picture below shows part of the Armored vehicles lined up from our Cavalry Troop. 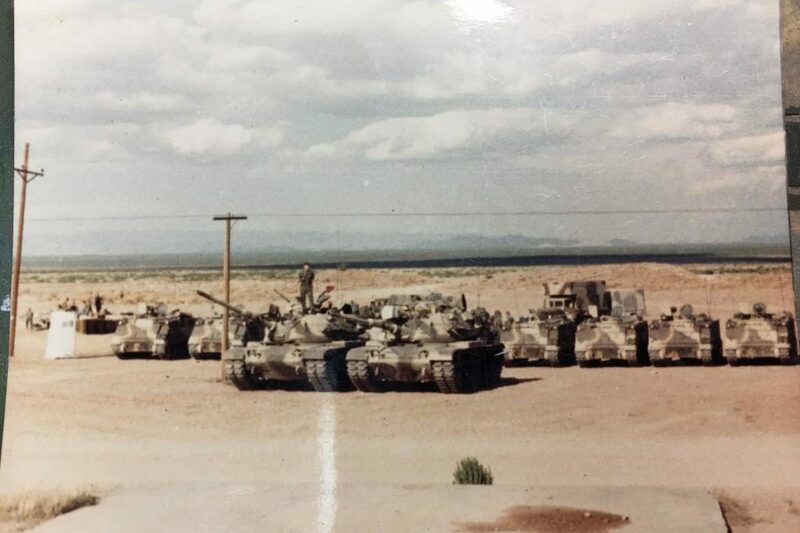 These pictures were all taken at Ft. Bliss, North of El Paso in the mid 1980’s. If you look close, you will see that no two vehicles were painted “Exactly” the same. In stead, they were “Close Enough”. Here are out tanks on the firing line. The tanks displaying green flags have their weapons cleared and nothing is loaded in a chamber. The ones with red flags have live rounds chambered and are ready to fire. You can see the Commander’s M-85 .050 caliber machine gun barrel in the foreground of this photo below. 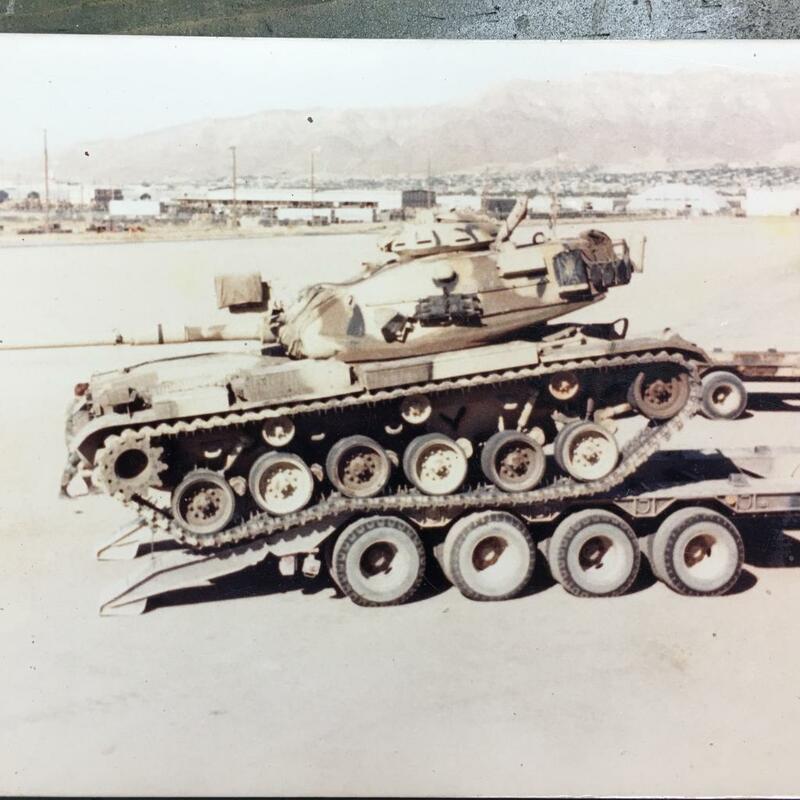 Here’s my tank being loaded onto a flat bed trailer in this picture below. 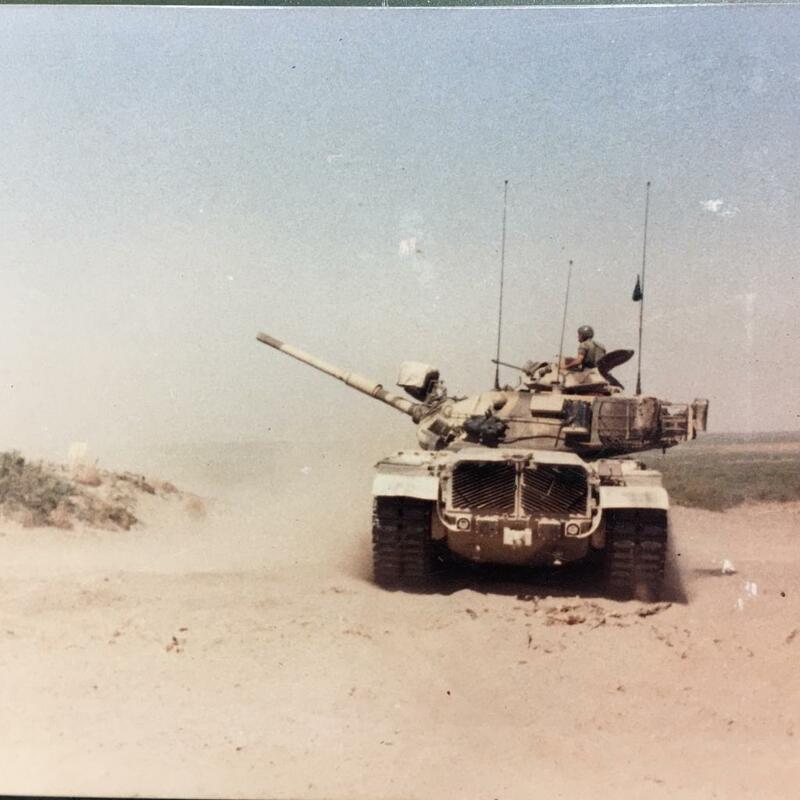 Most of the time we drove our tanks out into the desert for field training exercises. On the rare occasion, they were towed out on a flat bed trailer like this. 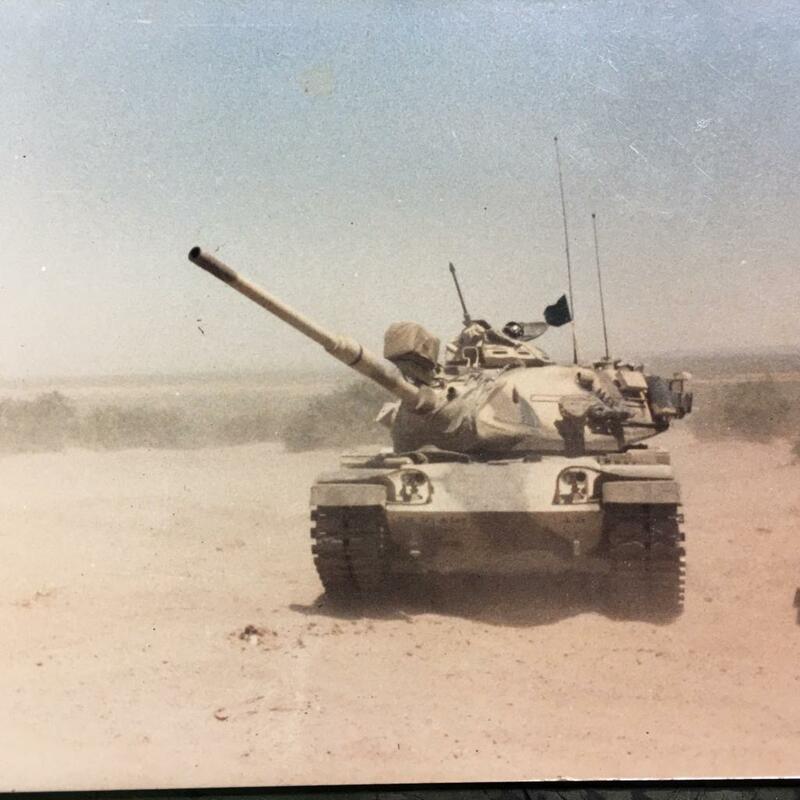 This picture below shows my tank again, just as a dust storm is starting to kick up. During this time period when this particular picture was taken, all of our vehicles were painted in a solid Desert Sand color. 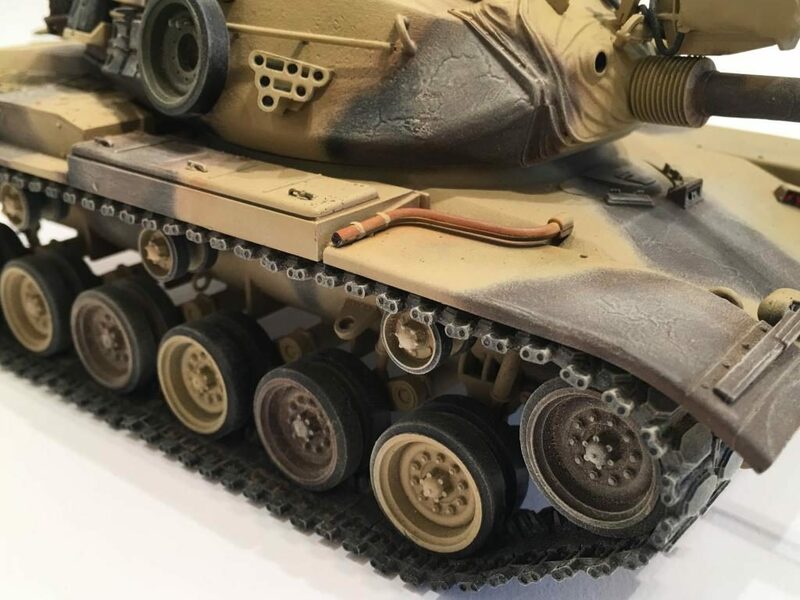 This is the Academy model, that has the separate rubber outer road wheel parts that are actually made from a different type of material. So far they have held up well… The kit has been upgraded with AFV Club individual tracks. 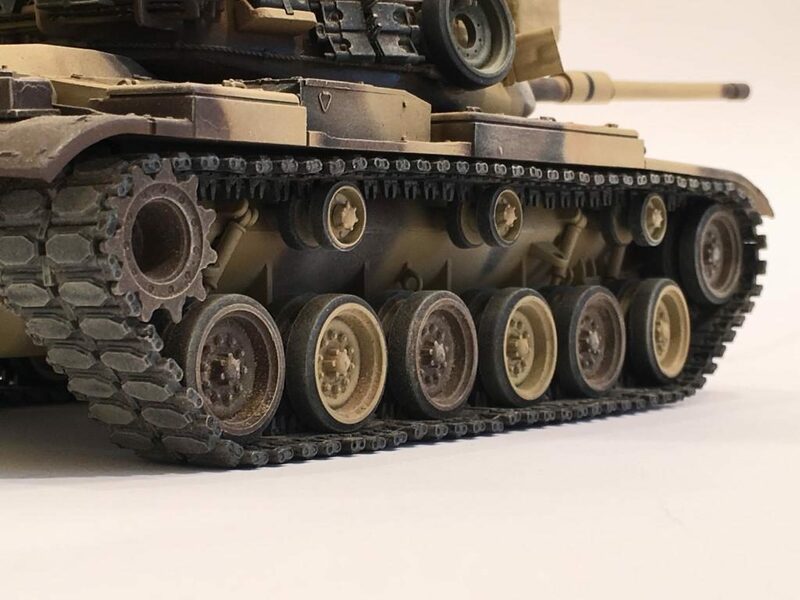 The tracks were kept pretty tight on the real M-60’s, so the track slack is kept to a minimum on my model. 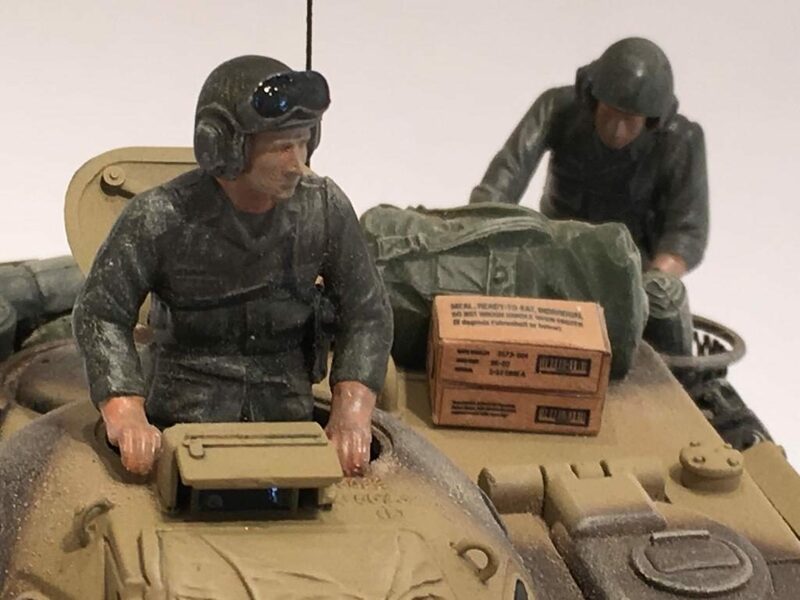 I added two “Modern US ARMY Tank Crew Members” crew figures from Dragon / DML. Painting figures is not something I’m good at, so I left them in overall OD Green, which is typical of a uniform we could have worn back then. We wore either solid OD Green, Woodland Camouflage BDU’s or the hated charcoal treated “MOPP” suits, which were also overall OD Green. The later issue MOPP suits were also issued in the Woodland Camouflage pattern. The bustle rack was filled up with various items like ruck sacks, duffle bags, sleeping bag mattress rolls, MRE boxes, ammo cans. etc., very similar to things we often carried back there. 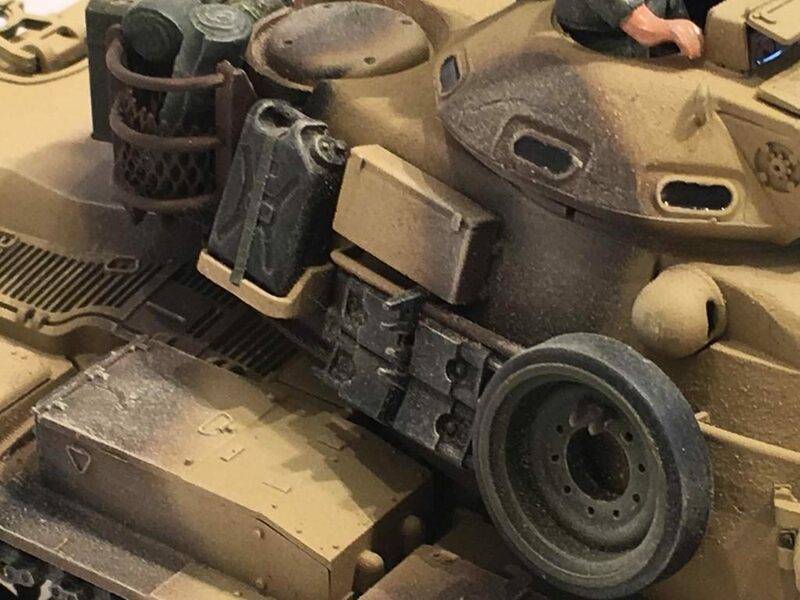 Another addition is a 20 MM ammo can that was sometimes bolted on the Port side rear fender. On some of our tanks we had these. They were nice to keep things in since they were water tight, and kept the annoying desert sand and dust off your stuff inside. 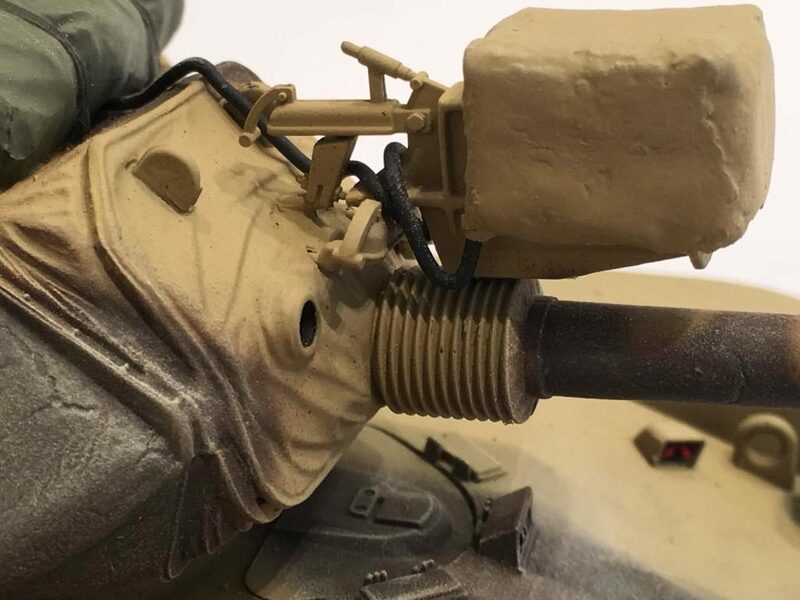 If you look closely at the black “Potable Water” cans on the sides of the turret, you will see how I scratch build straps that replicate the real ones that held the cans in place. 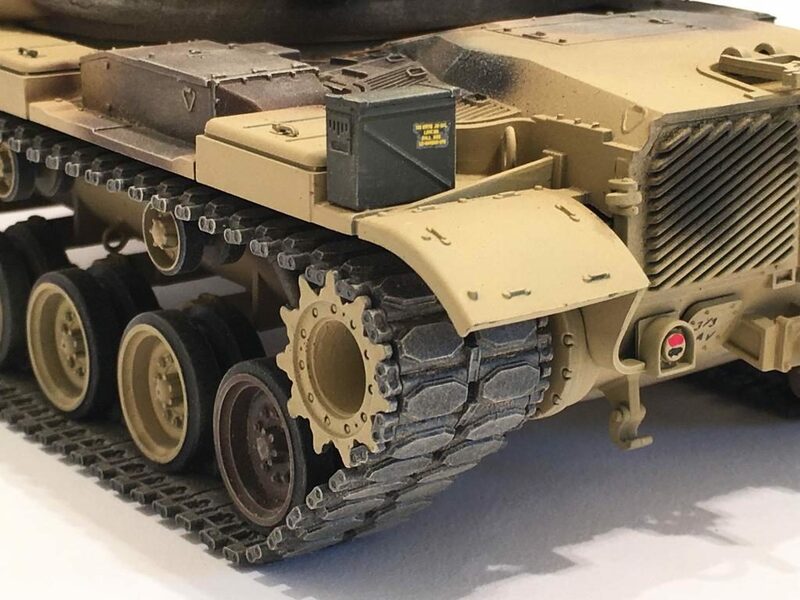 The spare track and road wheels were often carried on our tanks in the manner shown on this model. Sometimes, these items would be used in the field to make necessary repairs as needed when parts were not available. This was a typical arrangement, but not always identical from tank to tank. You will also notice spare track pads bolted on the sides of the bustle rack. This is how we stored them, bolted onto various places on the outside of the bustle rack. The exterior “First Shot / Second Shot” Fire extinguisher pull handles mounted on the front slope were painted red. 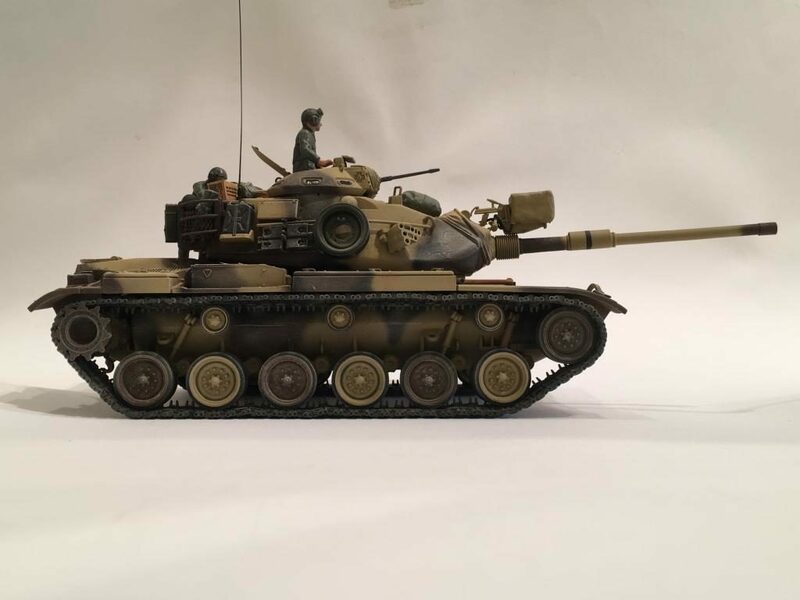 This was done on the real tank as well. 37 additional images. Click to enlarge. Thanks Tom. I’m glad you liked it Sir !!! Thank you Martin. I appreciate the compliments. I wish the crew members would have turned out better……………. this is one of my weak areas. I am very pleased to see that you liked it. 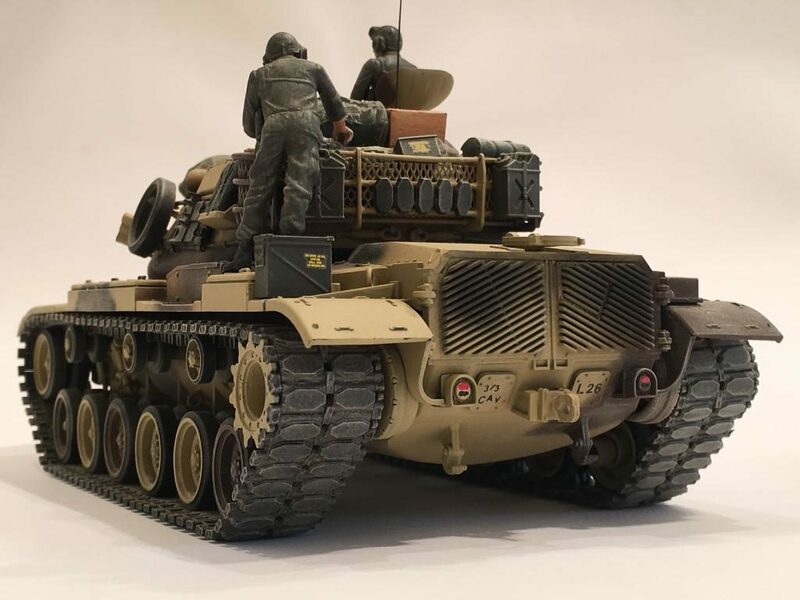 Excellent build, excellent attention to detail (always good to have “first hand” knowledge) and excellent photography as well. And let me add my thanks for your service. Top-notch posting in all aspects,Louis. Good work! Thank you Craig. That sincerely means a lot to me. Sorry for the double post…………. I hit the reply button too quickly. 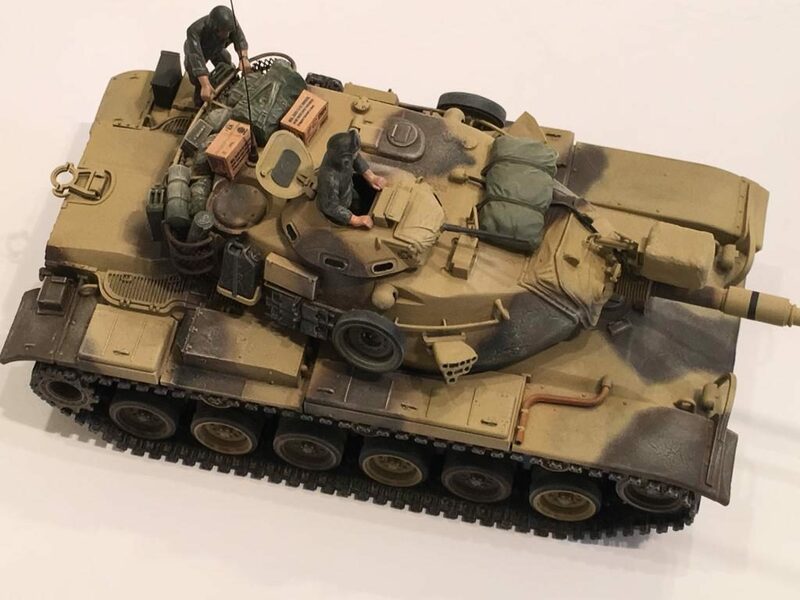 Anyone would be delighted with this model. I think the build and the writing demonstrate just how well you know the machine. And that advantage really shows in the outcome. For me the sum of the story and the model is a little greater than either on their own! Thanks for sharing both! Paul, I couldn’t agree more! Since I spent several years on these old beasts, I can attest to the quality of Louis’ memories. They’re spot-on and helped ME remember some details! Louis posts a great “Package Deal” write-up. Great quality build, photos, & story with facts. Muy Excellente’! Thank you Jeff. This coming from a fellow tanker is a great compliment. I appreciate this sincerely. Thanks Amigo !!! 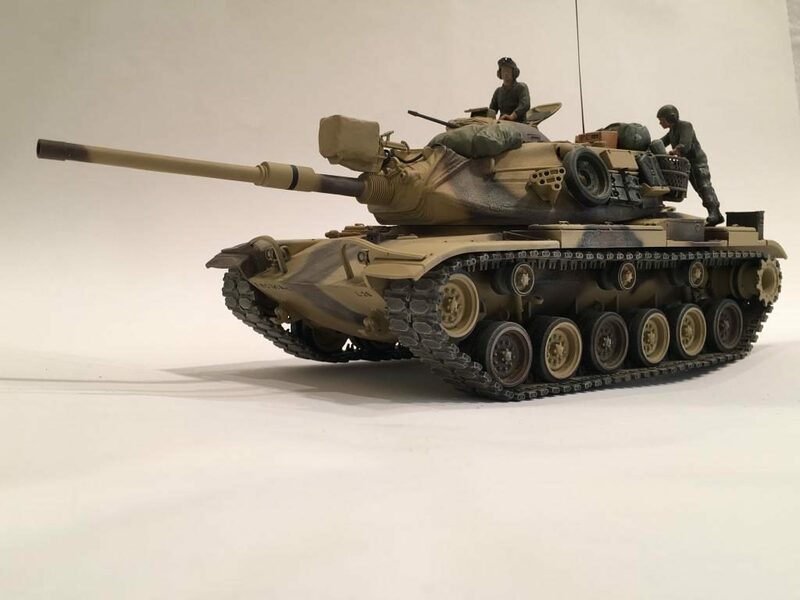 Paul, I’m glad you enjoyed the story line behind the writing, as well as the photos of the “real” tanks and my model. I had some of my most memorable times when I was in the Army. Some good, some bad………. as any veteran will tell you. Thanks for the compliments my friend. 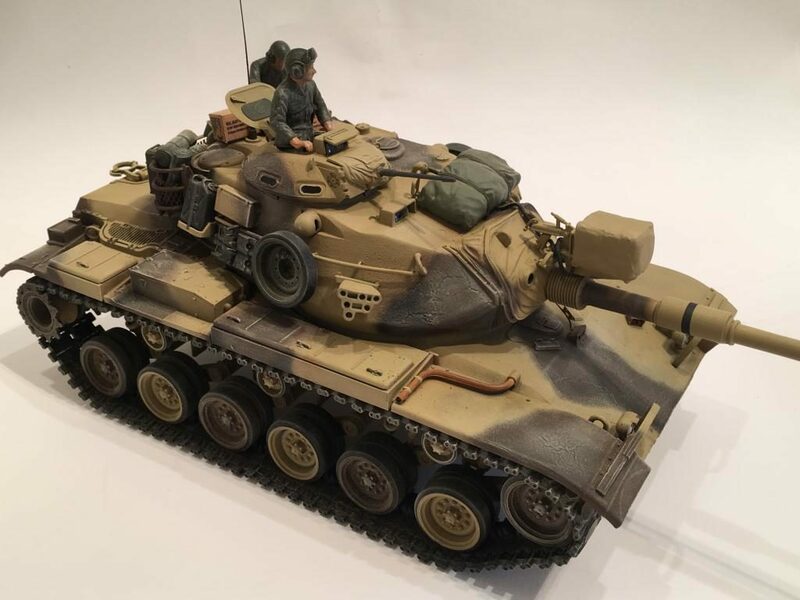 Another great looking tank Louis. Good job. Outstanding, Louis! This provided a great trip down memory lane! 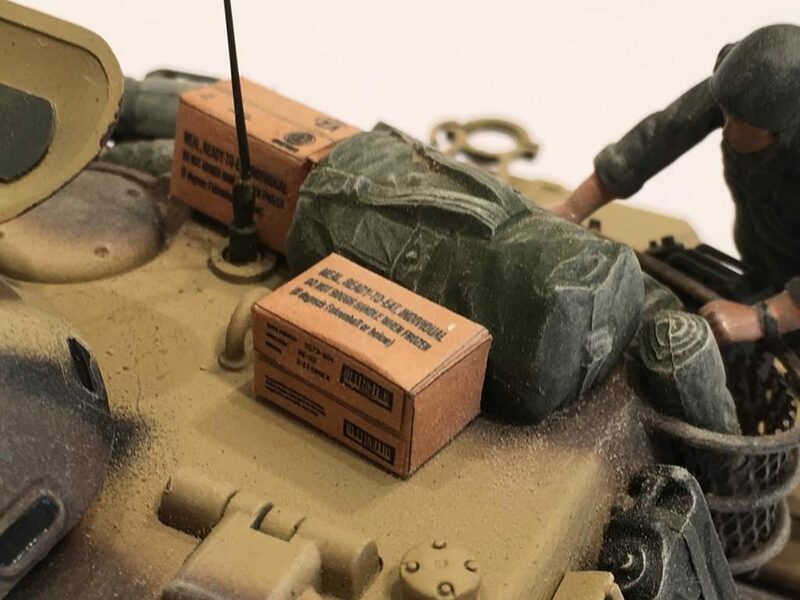 We didn’t bolt a 20mm ammo can on the L rear fender, but it looks like a really good idea. 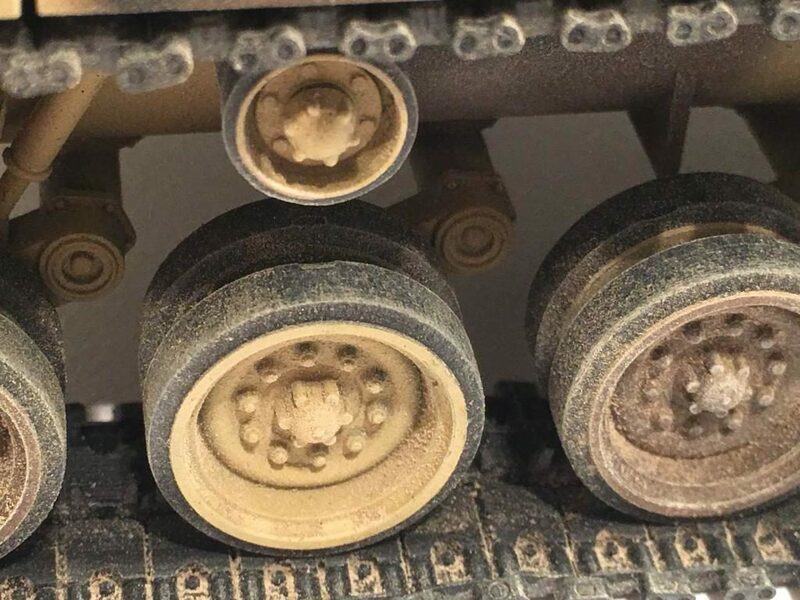 I also like the spare track pads on the bustle … seems like a great place for some spares. Our 1st shot/2nd shot protective cover was also painted red like the handles. I’m surprised you didn’t have the 2X4 across the headlights – I thought it (almost) came from the factory, it was such a good idea! I see your panzer had the smaller, newer (I think) searchlight. Nicely done on the light & cover. Our grenade launchers stayed covered, too. I never saw a grenade launched until my 1st Table XII at Graf on M1s. Wow! You guys had the tootsie roll sleeping mats & the new style MREs! 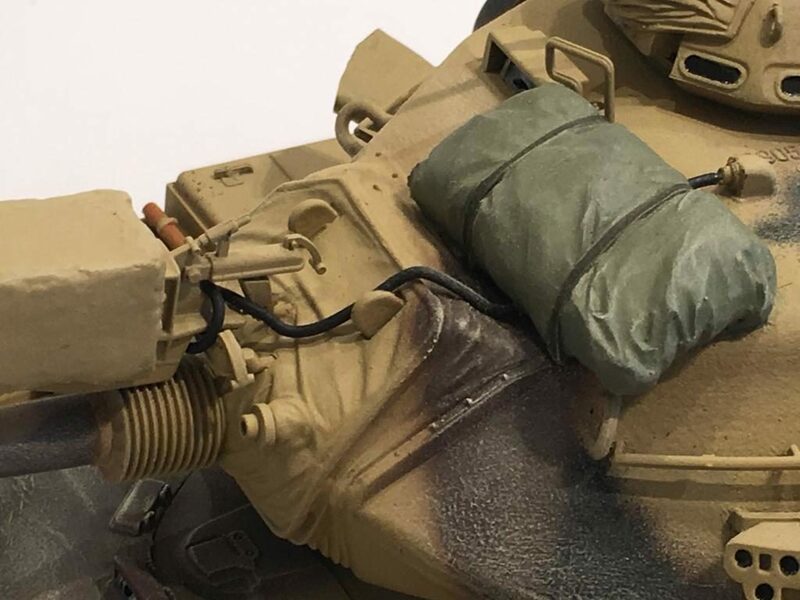 When I was on M48s, M60A1s, & M60A3s, we were still issued air mattresses for use under our fart sacks. I didn’t get a tootsie roll mat until I went to Germany in ’83. They were one of the actual “better ideas” that got issued. MUCH better than the blow-up, perpetually leaky air-mattress! I still have a mattress repair packet somewhere in my leftover Army junque! Ahhh, the memories! Thanks for posting the many great photos as well as the write-up. Thanks Jeff. I’m sure this one jogged a few memories for you………… On the subject of track pads, we placed them all over the bustle rack. 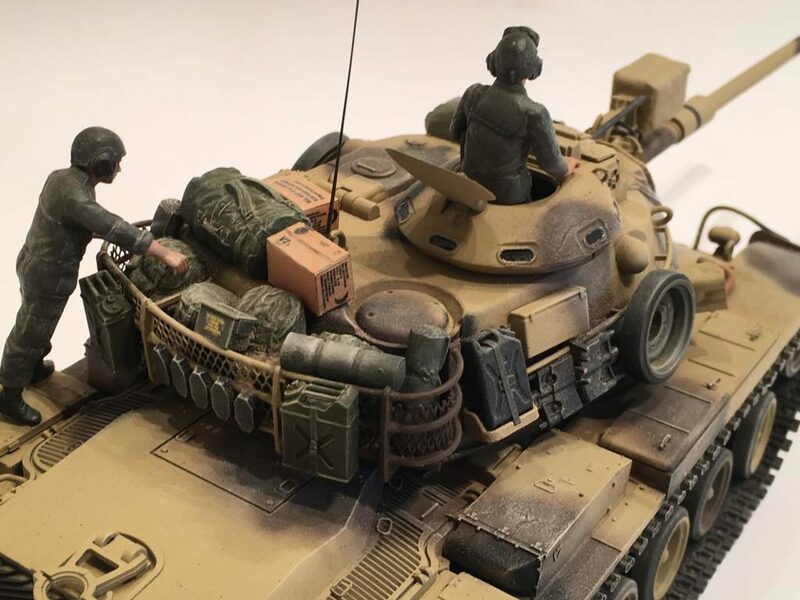 If you look close at several photos of the actual tanks that I posted, you will see that they were even sometimes mounted on the sides of the bustle. On several of the earlier tanks that I crewed at Bliss, we had the wooden 2 X 4 you mentioned. 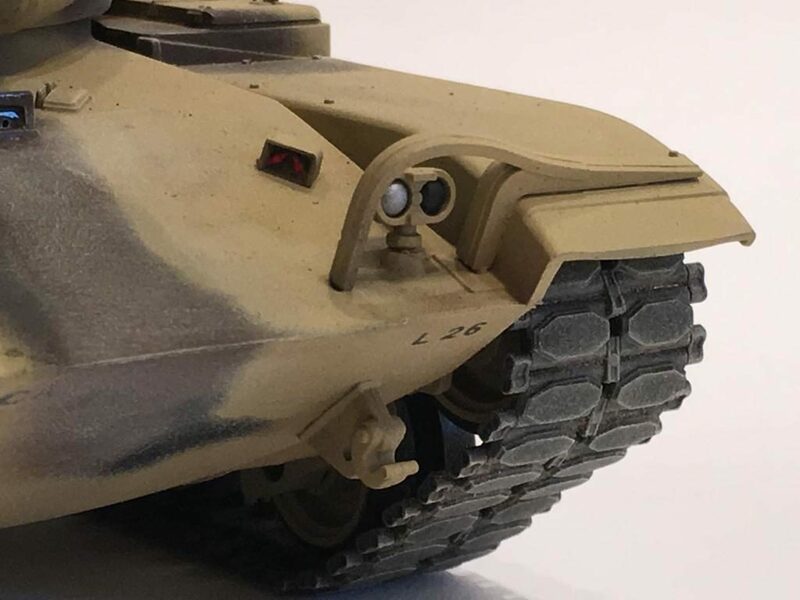 If you look at the 2nd and 3rd photos of the real ones inset in the beginning of the article, you can see the wood mounted between / behind the head lights. Believe me, the wood saved my shins from getting tore up several times when the front slope was wet and became like ice. This particular track I modelled had the newer style / smaller search light. If I remember correctly it was both IR and regular “white” light. 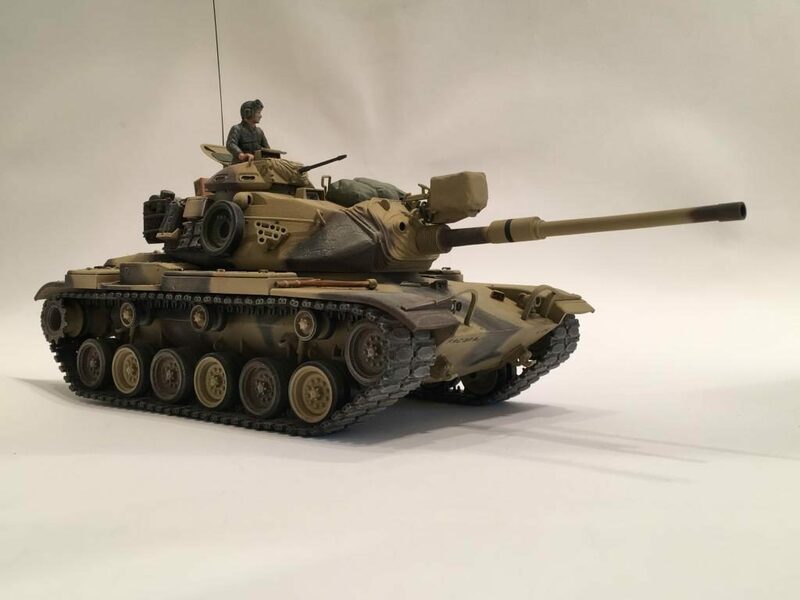 Some of our tanks had the larger older one similar to what they had on the M-48’s. We didn’t start getting the MRE’s (Meal, Rejected by Everyone) until later on. Before that we ate C-rats. I still have my first P-38……………. I keep it on my keychain to this day. I’m glad to see that you liked the article. Thanks again buddy. Take care Sarge. By the way, your crew figures look great. You don’t need to worry about them. Plus, every one you do makes you better! Thanks for the words of encouragement with the crew figures…………. Believe me, I need all the practice I can get !!!! Louis, this is a beauty, wonderful attention to detail and a very realistic look. Yaa, I like it ! 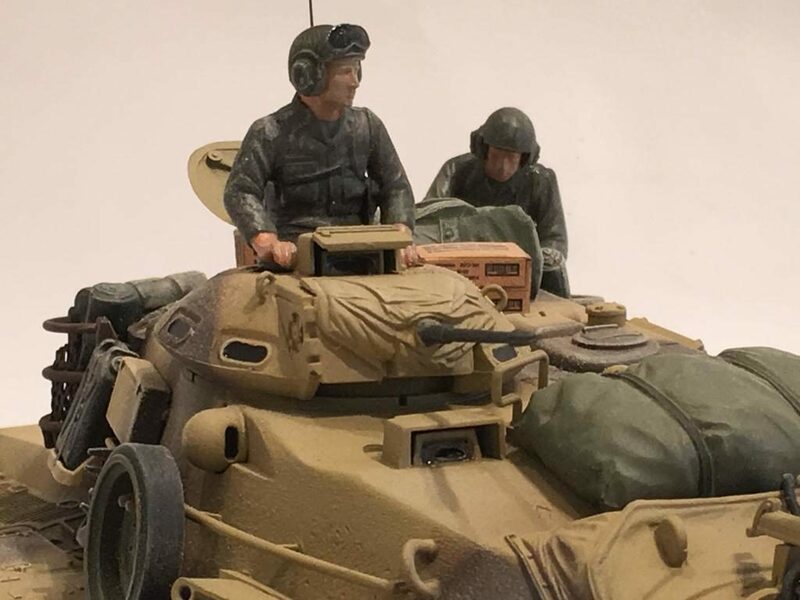 If you ever find yourself around Palm Spring Ca., just east of the Joshua tree National park exit, there’s a wonderful little museum on the main hwy called the Gen. George Patton museum. They have a bunch of these in this camo scheme. Also a bunch of other stuff. Its a neat little “side show” , and worth the stop if your driving by it. Who knows, if I’m ever out that way …………. I’ll have to make it there. 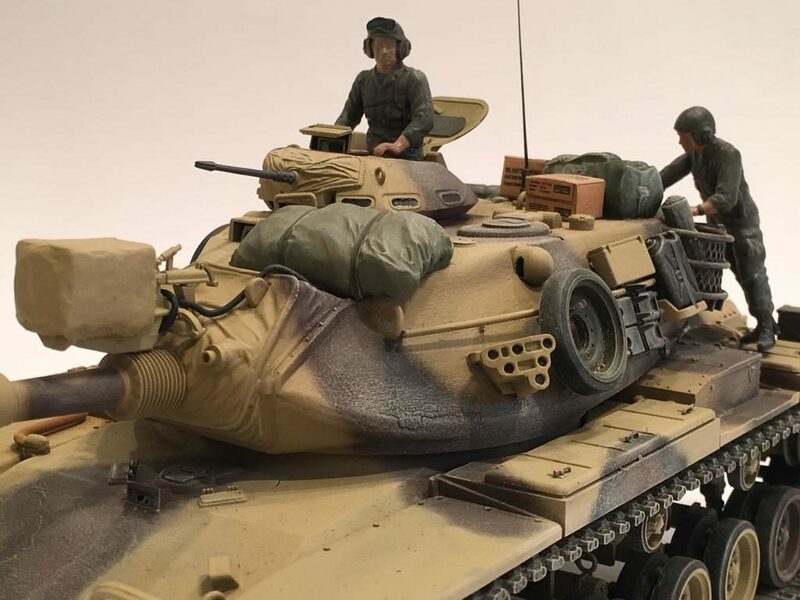 I’ve been to the Patton Museum of Armor at Ft. Knox several times, and then a few more once they changed the name to the “Patton Museum of Cavalry’, which I am a little biased towards……. Now I’ve heard that the collection has moved down to Ft. Benning. I appreciate the compliments buddy……. Thanks again. Thank you Jaime !!! 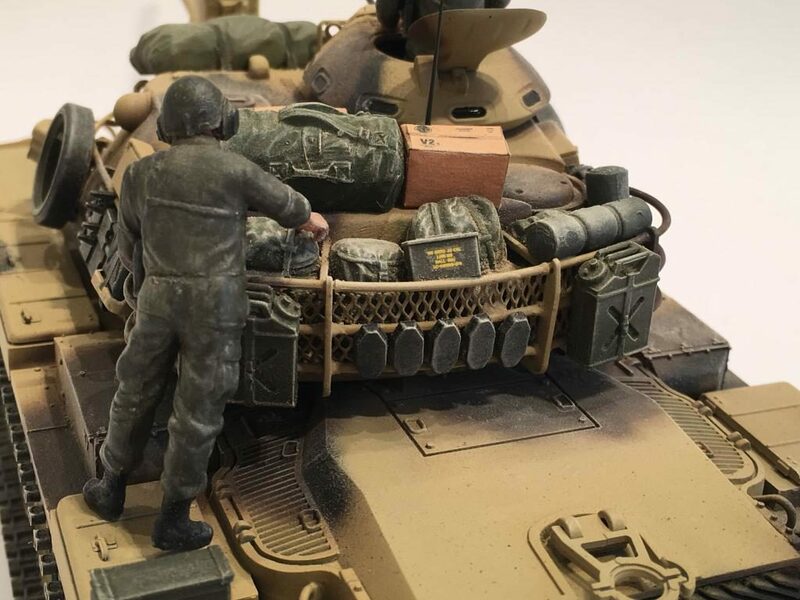 The mountain range in the background of the photo where the tank is being loaded on a tank hauler should really look familiar……………. It was probably very easily seen from your maintenance hangars. Small world indeed……. Louis, thanks for the photos of the real stuff, and the writeup on what you should add for a lived on/in tank. I’ve learned something about the tank, by reading your descriptions. I always to try to increase my knowledge of subjects I don’t usually make, just in case. Bernard, I try to incorporate a little history lesson or a “How to” in each one of my articles. 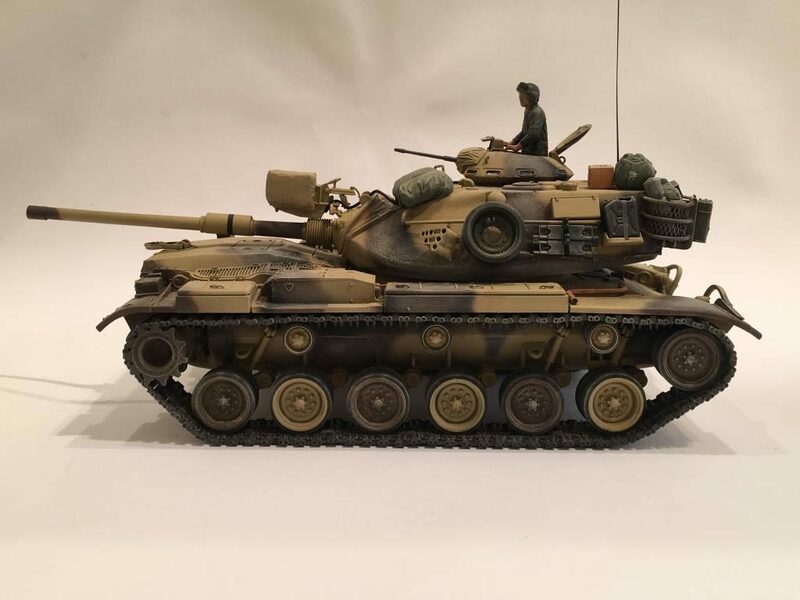 I hope it helps to bring life into the model. I’m glad you learned something. That’s something I try to do each day. Thanks again my friend, and I’m glad you enjoyed it……. 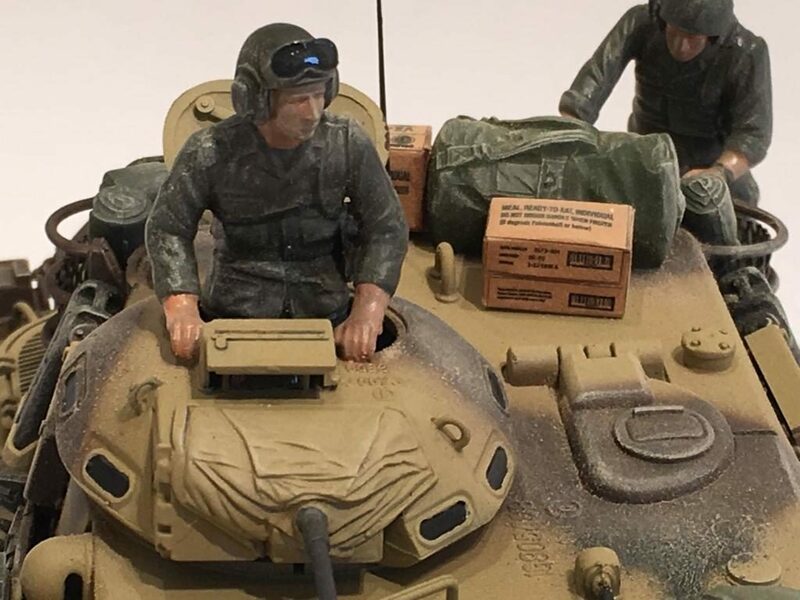 Very cool, I always like seeing vehicles and aircraft modeled after ones the modeler served on. I know I loved building “my” COD. You can sure tell you put loads of TLC in this build. Thanks for sharing and thank you for your service! Thanks Rob. I just checked out “your” COD build thread………… Very impressive !!! Looks like you put a load of TLC into it as well. It does make a bit of a difference having first hand knowledge about a subject. Thanks again for the compliments. Great model, Louis, obviously a labour of love. 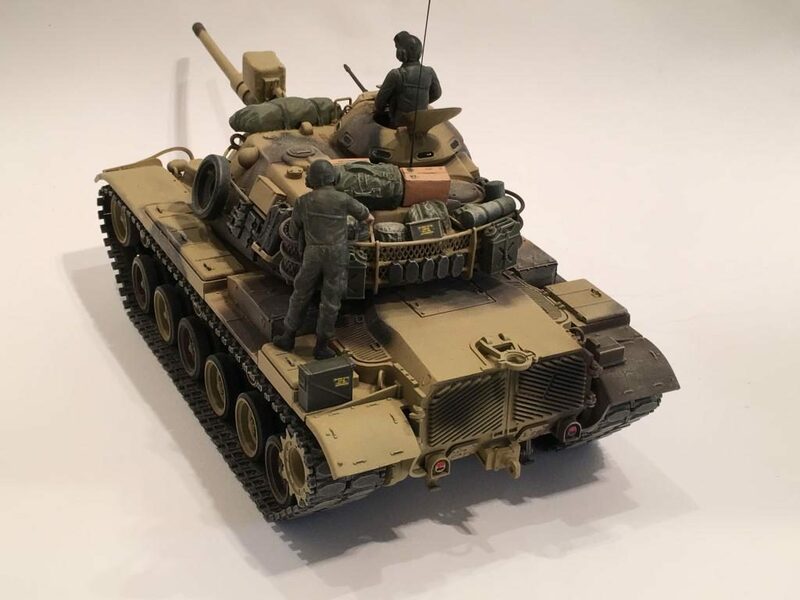 All those little details you’ve described and added to the model make all the difference between assembling a kit and actually making a model. Thank you George. I appreciate the kind words Sir !!! 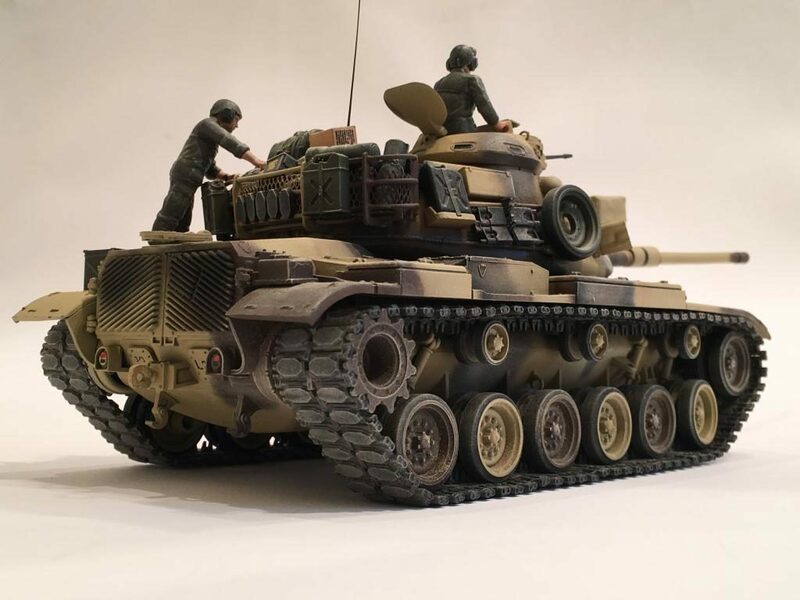 A build with a personal history, looks fantastic Louis. Hello Bernd. Thanks for the compliments on this build my friend. Very nice Louis, I do remember the 3rd ACR kicking up lots of dust at Ft. Bliss. Hand salute from a former duck hunter. Hand salute back to ya !!!!! 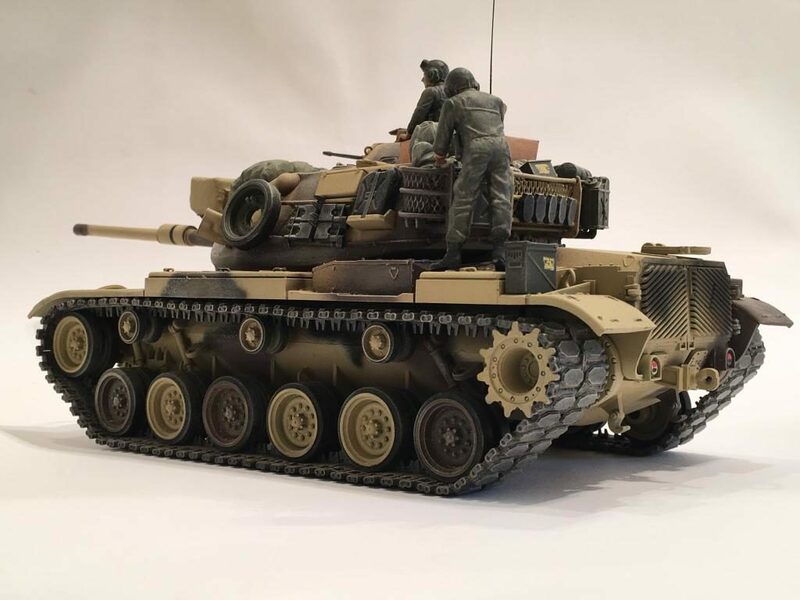 Great model, and great story to go with it! Thanks Greg. 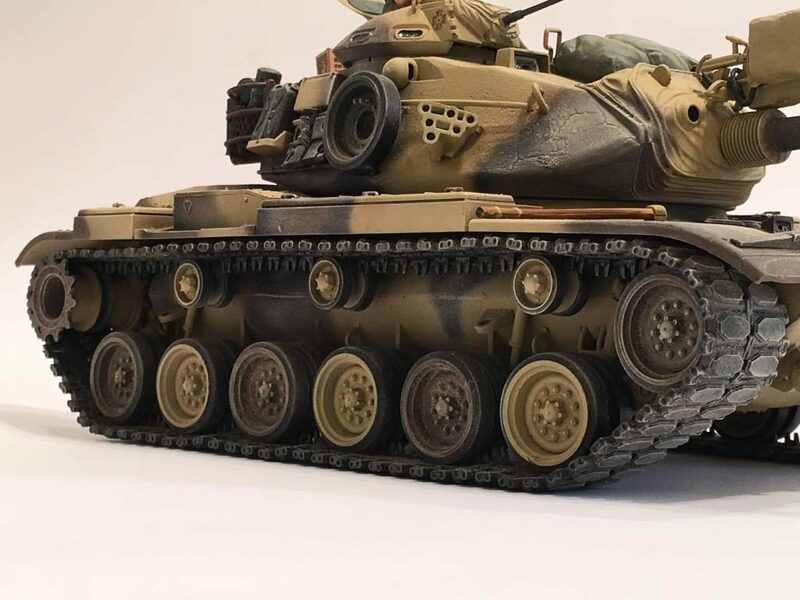 I simply wrote what I knew about the pictures and tank. I sincerely appreciate the compliments buddy. Well, Louis, it looks like a labour of love. Well done on all counts. The anniversary of my enlistment in the Army was the kick start I needed. Now she is proudly displayed as she should have been all along. Really very nice. I like the detail. Great story too. Thank you Tom. I am pleased to see that you liked the article too. Just great ! love the personal touch. Always liked this Brut, and I think it did well for itself in Desert Shield. Your crew looks like they can’t wait to dive into those MREs, I’ll take the chili mac please. I liked the Tuna MRE, and when I was really hungry then it didn’t matter. Though I didn’t care for them when you didn’t add water in the ones that were supposed to be hydrated before consumption. 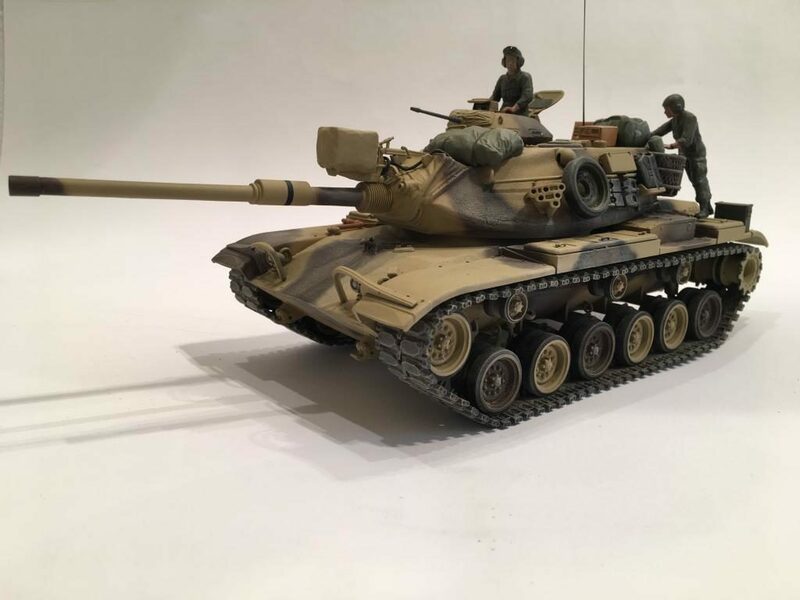 This model was the USMC version by Academy, and it had the reactive armor plates on it. I just never installed them. For what she was, the old girl did OK. Give her a little TLC and she would treat you good. If you didn’t she could get ugly…………………..
With enough Texas Pete or McIlhenneys, you can get thru them. I always liked Clancys comment- Meals ready to eat- three lies for the price of one. Or meals rejected by Ethiopians. We called them MRE. meal Rejected by Everyone. It’s funny how all of the hot sauce “mysteriously disappeared ” from the mess halls right before we headed out to the field. Those are all good ones too that you mentioned. I really like the “three lies for the price of one “. Louis, so do I. The man had the touch. Clancy was a former insurance agent, in Southern Maryland. 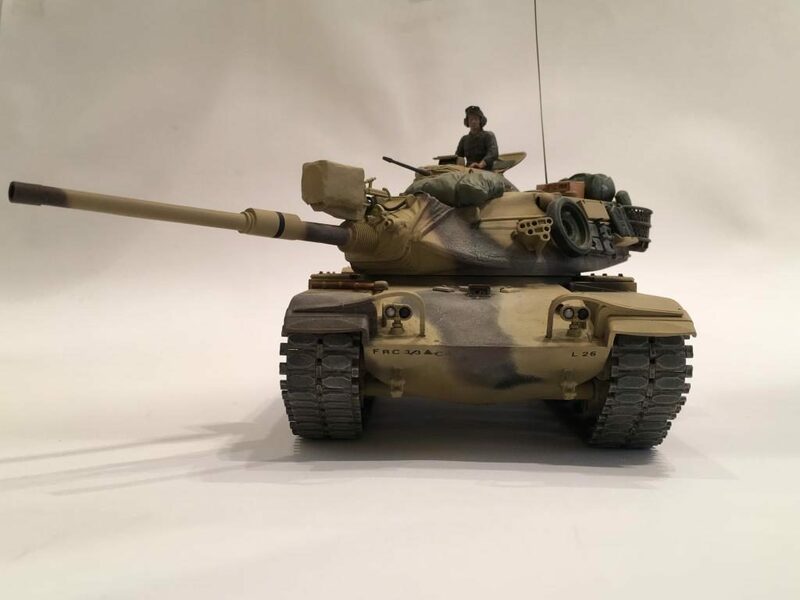 When he hit the big time, his wife bought him a tank for his birthday. Yeah, a working tank. He used to drive it around his property. I’m guessing a Sherman, never did see a picture. The rich aren’t like you and me, as Hemingway pointed out. 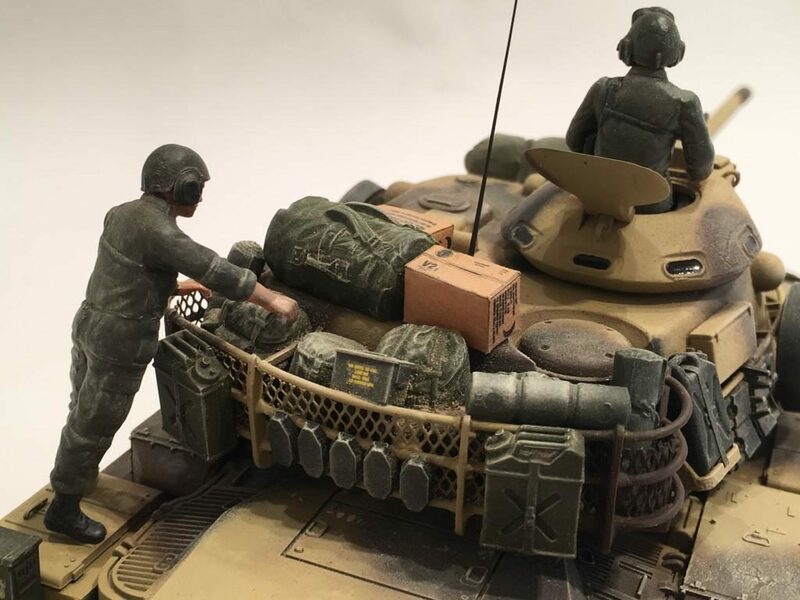 It’s really great to see such a nice armor model, built by its very commander! Excellent job Louis! Thank you Michel. I appreciate the compliments. It brought back many memories building this one. Louis, here I am, adding yet another comment … and a photo, if I can do it correctly. I just can’t stay away. Like you, I still have my 1st P-38. I carried on my dog tags my whole career, even after the MREs came about. Robert Royes: I’m with you – I preferred the chili mac, though I also liked the beanie-weenies, and the ham slices. We called ’em road wheels, too Lou. Ham slice, cracker, sleazy squeeze cheeze, & liberally sprinkled over with Tabasco sauce. Yum. When we got the MREs I developed a liking for the Tuna casserole – which is really odd since I ABHOR fish! My favorite was the beanie-meatballs … and Tabasco, of course. I also liked the Egg thing. Tabasco (as always) then squeeze the cheese on the egg, throw it on the exhaust grill for about 45 seconds to a minute while the tank’s turbine power pack (engine) was running and it wasn’t too bad, PLUS most of the guys didn’t much like the egg thingie. I didn’t like anything with chicken like the Chicken LaLa King or the Chicken with Bar-B-Q sauce and rice, tho they were edible in a pinch. I LOVED the dehydrated strawberry “cookie” but apparently, most didn’t so they disappeared fairly quickly from the “menu.” By the time I got out after Desert Storm, they were on about the 4th or 5th Generation of MREs but they’re on about the 9th or 10th generation, nowadays I hear. I’ve paid for worse food in restaurants occasionally. I didn’t think the MREs were all that bad … considering. Mix the powdered cream in the powdered chocolate hot drink mix, add a half to whole packet of sugar ( or more, depending on individual taste) add a couple spoons full of water; stir really well and – Voila! Ranger Fudge! YUMMY! Dehydrated strawberries or peaches added to the mix was a nice change, too. ANOTHER Yummy! Enough wool-gathering. 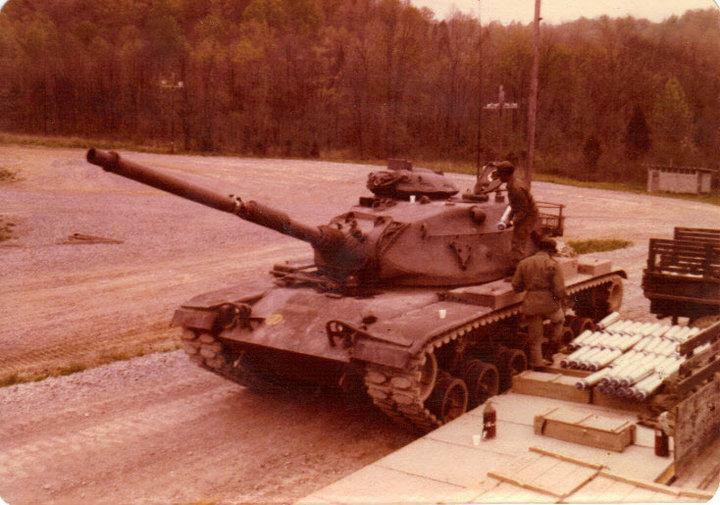 The picture is my M60A3 when I was stationed at the USAARENBD at Ft. Knox, KY. We’re loading up for a Gunnery test, as you can see. 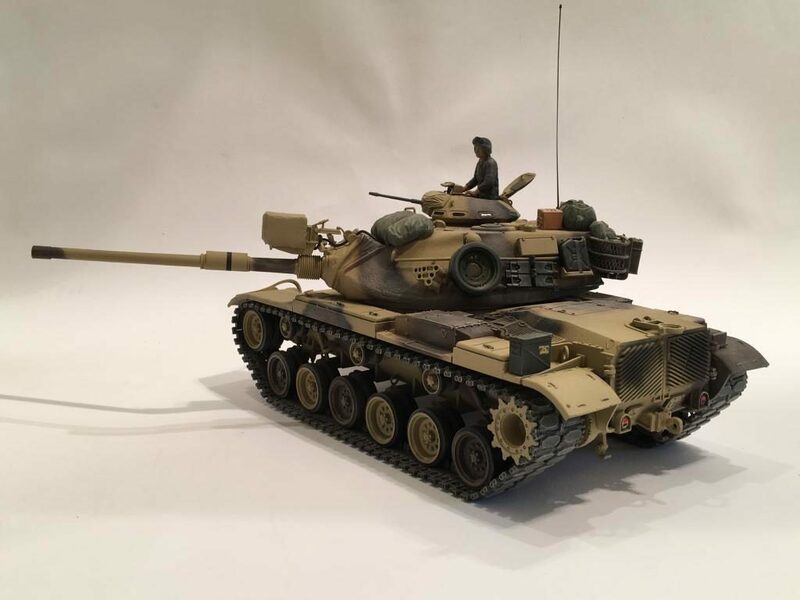 The bumper number was BD 103 and this was the prototype tank of the M60A3 series. 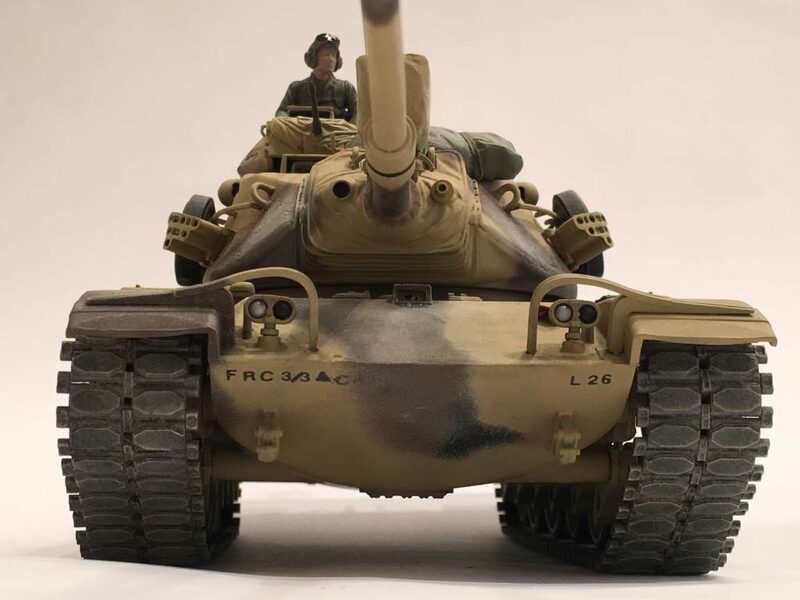 The big change was the TTS (Tank Thermal Sight) and new ballistic firing computer which made this tank a real “Tack Driver,” (A “Tack Driver” is a REALLY good, accurate shooter for those of you not familiar with our slang or jargon.) I shot over 1500 main gun rounds out of this tank. 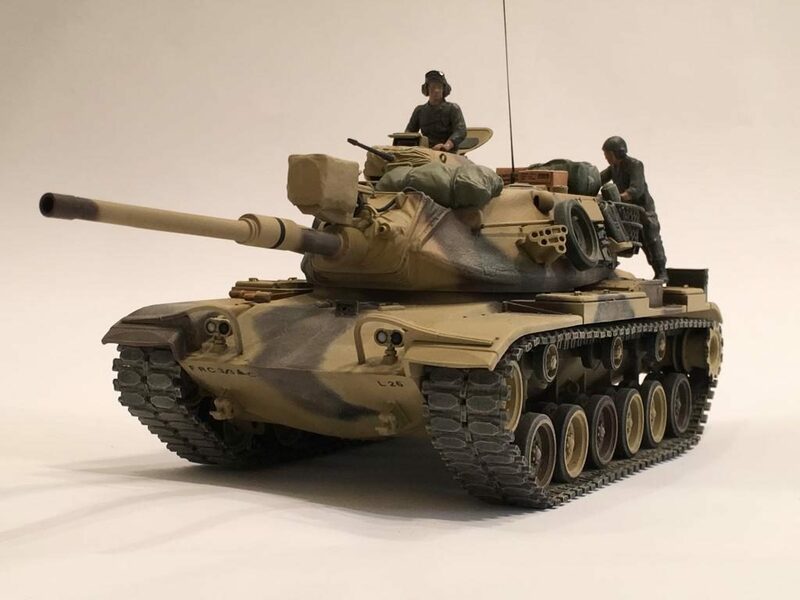 It was my favorite tank of the M60 series of tanks. I hope I can post this picture correctly. What a great thread. 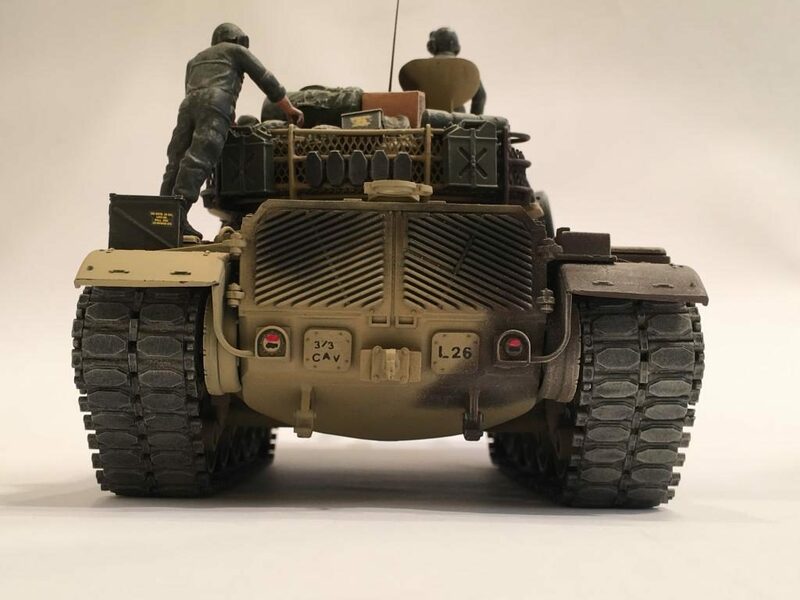 Like many others who did not serve, I love hearing the first hand stories and I’m really envious of you being able to build a model that clearly means so much to you. 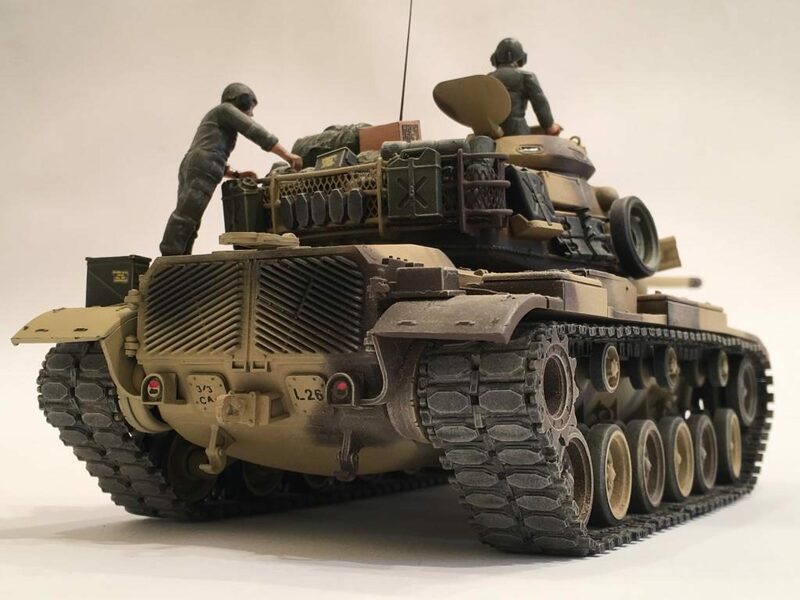 Louis, the M60 is just brilliant; the background stories just add to it. Jeff, thanks for adding your own memories to this. I’ve loved following this thread and salute you guys who have put yourselves in danger to keep us safe.